Although the Illinois Poison Center handles calls about human-related exposures only, we know many of our readers still need poison prevention tips for their furry, four- legged friends. Did you know there was an animal poison control center located right here in Illinois? Well this week the ASPCA Animal Poison Control offers some great tips to keep pets safe in summer heat. I’m sure the Lovin’ Spoonful wasn’t thinking of our pets when they sang this song, but our pets can certainly get into trouble during the hot summer months. Make sure your pets have shade and plenty of fresh water if they are put outside. Signs of heat stroke in dogs include excessive panting or difficulty breathing, increased heart rate, drooling, mild weakness, stupor or even collapse. Animals can develop seizures and bloody diarrhea and vomiting along with an elevated body temperature of over 104 degrees. Animals with flat faces, like Pugs and Bulldogs, are more susceptible to heat stroke since they cannot pant as effectively. Never leave your animals alone in a parked vehicle. Cars heat up very quickly in hot temperatures and can be deadly to pets. When the temperature is very high, don’t let your dog linger on hot pavement. These surfaces can really heat up and burn sensitive paw pads. Even though we think about cold weather being associated with antifreeze, the engine coolant that we use during the hot months contains the same ingredients. While antifreeze/coolant has a sweet taste, animals that don’t have access to fresh water are more likely to ingest it. Initial signs include drunkenness that progresses to kidney failure, seizures and death. Many of us apply herbicides to our lawns to help kill the weeds. These can be safely used around pets if a few rules are followed. Correct dilution of liquid products is important for your lawn and for your pets. Once the area where these products are used is dry, it is safe for your pet to go back out in your yard. Dilute any puddles on the driveway or sidewalk with water. If using a granular product make sure to follow the recommended application rate and sweep up any spills. After the granules have been watered into the lawn and the lawn is dry, it is safe for the pets to be back on the yard. The granules themselves will not disappear but the active ingredient has been washed out of the granules and into the dirt. During the summer we may use insecticides on our lawns, in our houses and on our pets. Always read and follow label directions. 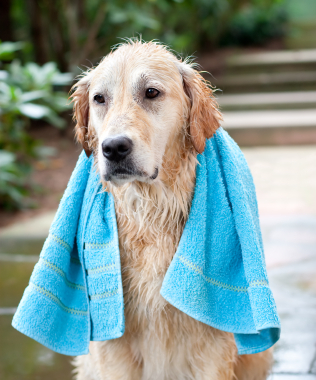 Keep pets off the lawn until the products are dry. Dog flea and tick products may cause tremors and seizures if used on cats. While compost piles are good for the environment, they can be harmful to our pets. Compost piles and even rotting fruits or nuts from our trees can develop mycotoxins. ( compounds made by mold) that if ingested can cause tremors and seizures in our pets. Make sure your pets don’t have access to the compost pile and pick up all dropped fruit and nuts. Summer is the time of barbeques and backyard parties. Remember that the food and drink offered to guests may be poisonous for your pets. Avoid raisins, grapes, onions, chocolate and products with the sweetener xylitol. Also, keep alcoholic beverages away from pets, as they can cause vomiting, drunkenness and coma. If you’re in Illinois, you know who to call when your child is exposed to a potentially harmful substance: the Illinois Poison Center (1-800-222-1222); but what happens if it is your pet? There is a dedicated animal poison control center you can call – 1-888-426-4435. The ASPCA’s Animal Poison Control Center is located in Urbana, IL. It is the only 24-hour, 365-day facility of its kind in the United States. We are staffed by 25 licensed veterinarians, 10 of whom are board certified in general and/or veterinary toxicology. We provide assistance to pet owners and veterinarians with questions related to medications (both human and veterinary), toxic chemicals, plants, products and substances. In 2011, the ASPCA’s Animal Poison Control Center handled approximately 165,900 cases of pets exposed to possibly poisonous substances. For a complete list of the top 10 pet toxins of 2011, and other items that may pose a danger to your pets, visit our website. If you suspect your pet has ingested something toxic, please contact your veterinarian or the ASPCA’s 24-hour APCC hotline at 1-888-426-4435. A consultation fee may apply. But if you need to call the Illinois Poison Center for yourself or a family member or friend, the call is free.